The Morakniv Classic 125th Anniversary Fixed Blade Knife is a handmade, limited edition knife specially designed to celebrate the 125-year anniversary of Morakniv. 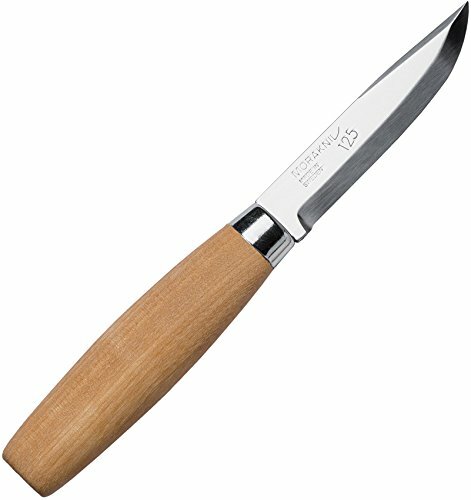 This beautiful knife features a natural wood handle, vegetable-tanned leather sheath, and top-grade Sandvik stainless steel blade. The natural, oiled birch wood handle is a classic representation of how Morakniv knives looked before they had their characteristic red handles, and the blonde leather sheath is sourced from Tarnsjo Garveri, one of the few tanneries in Sweden that still produces vegetable-tanned leather. The blade is top grade Swedish Sandvik 14C28N stainless steel that features excellent edge performance, razor sharpness, high hardness, and exceptional toughness and corrosion resistance. Stainless steel knives are less susceptible to corrosion and oxidization than carbon steels, giving them a longer life overall, plus they maintain edge sharpness for optimum cutting performance. The blade is stamped with 125 to commemorate the company’s anniversary. Morakniv has been manufacturing the highest quality knives in Mora, Sweden since 1891; professionals worldwide trust their quality materials and fine craftsmanship. Dimensions: total length: 7.1 inches (180mm); blade Length: 3.3 inches (84 mm); blade thickness: 0.098 inches (2.5 mm); weight: 2.6 oz. (73g). Limited lifetime manufacturer’s warranty. The Morakniv Classic Handmade 125 Fixed Blade Knife is available only while supplies last.